Going by newspaper reports, the top-of-the-line assault rifles such as Beretta’s ARX-160 (Italy), Colt Combat Rifle (the US), CA 805 BREN (the Czech Republic) and Israel Weapon Industries (IWI) ACE1 model failed to make a mark owing to the unrealistic General Staff Qualitative Requirements (GSQR). However, these trials are still being conducted and no final outcome has emerged so far, a highly placed source at Army Headquarters informed IDR. The source negated earlier media reports that the army has scrapped its December 2011 tender to procure 66,000 multi-calibre assault rifles on June 15. Though the chances are high for abandoning this foreign dream, not for any other reasons hinting at a doctrinal shift but to save itself of the embarrassment caused due to the unrealistic expectations from its GSQRs, he added. 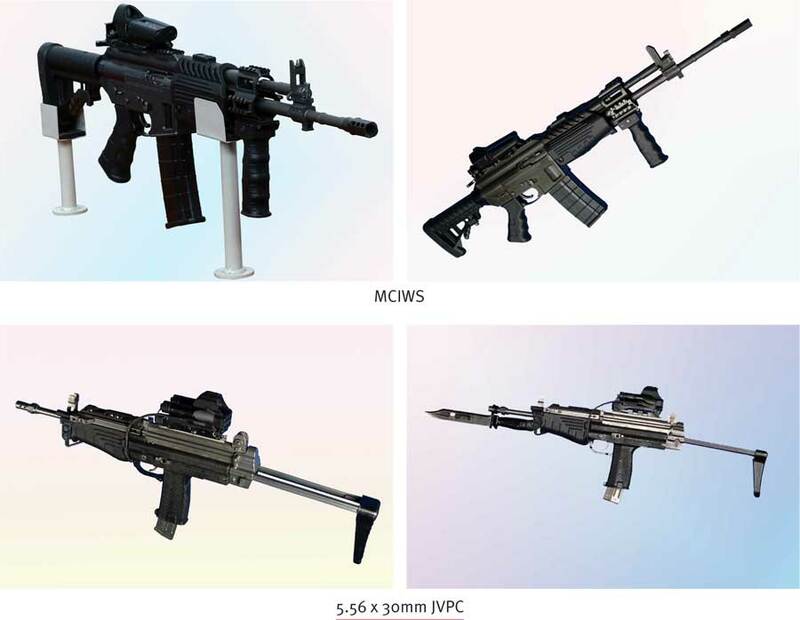 On the other side, braving all criticism of an inefficient INSAS rifle to its credit, unbelievably though, the ARDE has simultaneously developed a Multi-Calibre Individual Weapon System (MCIWS) as a technology demonstrator. The Indian Army, however, did not support this project and went ahead hunting in foreign lands for a dream assault rifle, thus ignoring the indigenous effort outright. Notwithstanding the fact that the hardy Indian Infantry soldier’s torturous wait for a new-generation assault rifle may now get even longer; the movers and shakers remain unfazed, caught in bureaucratic tangles probably set up by the Army itself. India, under the new vigour for “Make in India” mission, may in all likelihood abandon its four-year-old hunt for new-generation assault rifles with inter-changeable barrels for conventional warfare and counter-insurgency operations. Will the Indian marvel in MCIWS see the light of the day? The trials will be followed keenly by the small arms manufacturers the world over. The race for acquiring big-ticket weapons like fighters, helicopters, submarines, tanks, howitzers and the likes makes an assault rifle looks too small and may be unimportant as well. Advanced weaponry apart, infantry soldiers continue to be at risk without the basic modern bullet-proof jackets, webbing and lightweight ballistic helmets, terrain specific shoes and state-of-the-art field communication system – the fundamental right of a soldier. In a country where the caste, creed and corruption form the backbone of our democratic system, the Indian Army cannot be kept isolated. No wonder, the 1.18-million strong Army’s quest for 66,000 new rifles for its 382 Infantry battalions becomes a super lucrative deal (an estimated $3 billion to $4 billion) rendering indigenisation unattractive. It should come as no surprise if probed, that there are forces supported by the politico-bureaucratic-military nexus serving the designs of the arms mafia, who deliberately want this indigenous effort quashed. It may be surprising, but not really though, that our scientists can develop and launch a probe to Mars but fail to produce an assault rifle. According to sources in Army Headquarters, during the ongoing field trials, the double-barrel rifles of foreign make on offer – with a 5.56 x 45 mm primary barrel for conventional warfare and a 7.62 x 39 mm secondary one for counter-terror operations – have thus far not been found robust enough for the military operations envisaged. To understand the importance of an assault rifle it is essential to recall the developmental and operational history of the assault rifle. 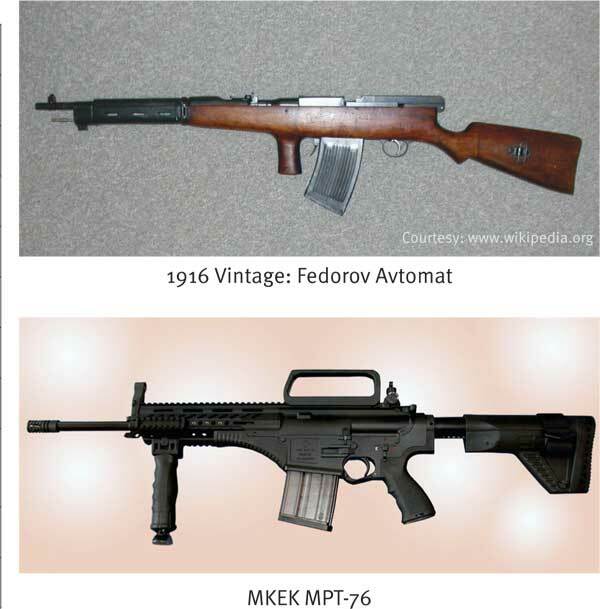 Getting to the history of automatic rifles; the USSR by the early fifties began to arm her infantry with intermediate-cartridge weapons (automatic and semi-automatic carbines, as well as Light Machine Guns). Full-power rifle cartridges were kept mostly for platoon-level medium machine guns, as well as for sniper rifles. The NATO and many other countries such as India went the “full-power” road with adoption of the 7.62 x 51 NATO round, developed in USA. Despite all stubborn efforts of the US Army to prove that its choice of new round was the right one, practice of the time proved that it was not the case. Full-automatic fire from newly designed 7.62 mm NATO rifles was ineffective to say the least and many countries like India (7.62 mm SLR) adopted the new rifles as semi-automatics. And in semi-automatic fire, the long-range potential of the 7.62 mm NATO round was basically lost due to limitations of the iron sights and the eye sight of a typical infantry soldier. In parallel, a lot of research was done to find ways to improve effectiveness of infantry fire. Not surprisingly, this research pointed out what was already known by 1918 – the capabilities of the average soldier in a typical combat situation limit effective rifle fire to 300-400 metres maximum. This old finding, along with the new concept of the “burst” firing to achieve “shotgun effect”, in order to compensate for slight aiming errors resulted in a decision to decrease the calibre of the assault rifle from typical 7 mm – 8 mm down to about 5 mm – 6 mm or less. This decrease offered several advantages compared to standard calibre reduced power ammunition, including faster bullets with flatter short- to medium-range trajectories, decreased weight of ammunition and guns, and reduced recoil. Several ambitious but largely unsuccessful programmes centred on sub-calibre flechette rounds, multi-bullet rounds, micro-calibre bullets (4 mm and below) and caseless ammunition. These were conducted in USA, Germany and elsewhere, but practical results were achieved only with conventional ammunition of .22” calibre (5.56 mm), developed in the USA during the late fifties in conjunction with the Armalite AR-15 / Colt M16 rifle. This brought to life what could be called the third generation of assault rifles. Technically, these third generation weapons were automatic rifles or carbines firing reduced power, reduced calibre ammunition. Inspired by developments in USA, by the late seventies – early eighties this concept caught on both in the West and the East. NATO adopted an improved version of the American 5.56 mm cartridge as a next standard rifle ammunition in 1979 while the Soviet Army adopted its own version of the small-bore reduced power cartridge in the form of the 5.45 x 39 round in 1974 along with AK-74 rifle. Today, forty or so years later, most armies of the world still use this “third generation” rifle ammunition (reduced power, reduced calibre) for standard infantry rifles and Light Machine Guns. Basically, rifles designed in 2015 are not much different from rifles designed in 1964 or so, except for some more modern materials and finishes. And that’s because they all fire the same ammunition. Limited success of the so-called bullpup configuration rifles also does not add much to overall combat capabilities of the rifle-armed soldiers, not to mention the fact that bullpup automatic rifles were designed and tested during the development and evolution of 1st and 2nd generations of individual automatic rifles. Another modern trend is an attempt to bridge the gap between full-power, standard calibre and reduced-power (reduced calibre ammunition with introduction of some “more powerful than intermediate” rounds such as 6.5 Grendel or 6.8 Remington SPC). Indian scientists keeping pace with the latest trends; the ARDE, Pune has developed an indigenous 6.6 x 43 mm calibre round compatible to the best in the world. These rounds are surprisingly close in basic ballistic properties to century-plus old warhorses such as 6.5 x 50 SR Arisaka, except that modern rounds have shorter and lighter cases (due to improvements in propellant chemistry) and bullets with better shape. 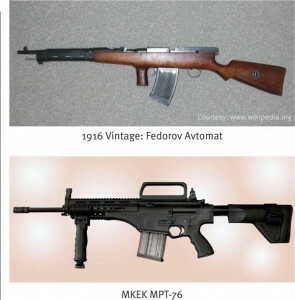 Therefore, in terms of overall performance any modern 6.5 mm – 6.8 mm “assault rifle” is not that far from 1916-vintage FedorovAvtomat, which fired 6.5 mm Arisaka ammunition. The most notable differences between modern and century-old guns would be materials, manufacturing techniques and overall reliability, especially in harsh and adverse environment conditions. The key factor that allows moderns soldiers to be noticeably more effective in terms of hit probability is, in fact, not the rifle or ammunition but sighting equipment. Modern telescopic day and night sights greatly enhance shooter performance at medium and long distances, and red-dot sights bring short-range performance under dynamic conditions to a whole new level, compared to old-style iron sights. However, in most cases, those sights are not unique to any given weapon, and in theory, anyone with access to a near-century-old weapon such as BAR 1918 or Fedorov 1916 could outfit it with modern sights with some minor adjustments. One interesting recent trend is a slow but noticeable return of the full-power automatic rifles firing 7.62 x 51 NATO ammunition. For some time, these rifles were issued mostly in semi-automatic, designated marksmen versions, with intent to increase reach of small infantry units armed with 5.56 mm weapons in desert or mountainous terrains. However, it appears that one such rifle per platoon is often not sufficient to fight enemies who are using distance, natural cover and modern body armour for protection against small arms fire. Therefore, several companies worldwide now offer 7.62 mm automatic rifles which are intended for individual, rather than platoon support use. 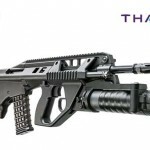 In May 2014, the Turkish army, the largest NATO military force in Europe, announced its adoption of the MKEK MPT-76 rifle, which appears to be a general issue, select-fire weapon based on the German HK 417. Blaming the Armed Forces for “unrealistic GSQR” has been the game to cover DRDO’s inefficiency for pretty long. I have spent 30 years waiting for an effective and useful rifle, hopefully my son might have one in his hand, but whether a DRDO make or an imported one, is not sure! 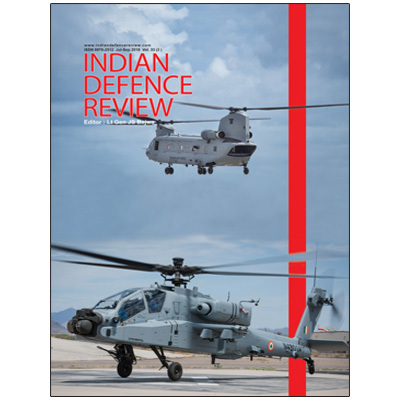 The DRDO is often remain disconnected with the need of the hour and the requirements of a soldier and therefore fail to understand what really is needed. Even a crudely made AK-series of rifle fare better than the famed INSAS which still suffer from few very basic problems (once it jams, God save the soldier!). The rifle’s zeroing goes for a six after cleaning since the rear sight is mounted on the movable breech-cover. Firing a rifle-grenade is yet to be seen since the grenade it yet to be ‘developed’. The theory of using 5.56 x 45mm NATO was not only to ‘maim’, but also to enhance the ability to carry more ammunition into a battle. As for the replacement to the 60-year old 9mm Carbine, the ‘dream-project’ is yet to see light of the day, a soldier still carries 1960s manufactured, repeatedly repaired 9mm Carbine that poses more danger to the user than the enemy. I fail to comprehend where do we falter? Even Singapore makes world-class small arms (ST Kinetics). Indian police and paramilitary forces carry better individual weapon than a infantry soldier, I feel ashamed. Please do not blame the ‘arms mafia’ they have existed since the beginning of 20th century and will continue as long as non-industrial nations buy weapons. Here the nexus seems to be between the DRDO-OFB-bureaucrats (MoD) thereby leaving the armed forces hang in limbo. It is shocking to see that the armed forces do not even have pistols! DRDO’s tactics of re-inventing of wheel is the major cause of concern. In case we lack the expertise for the basics, we can always do what majority of the developing nations do–“copy and modify”. Wikipedia says that OFB is manufacturing Israeli Tavors, its truth is yet unverifiable. Indian Government should give an opportunity to Indian scientists to work and develop assault rifles with worlds best assault rifle manufacturing companies such as AK 47 family , Colt , H&K , Beretta under make in India concept , for Indian versions like Navy , Army , Air force plus for Special forces like Marcos ,NSG , BSF , CRPF , SRPF , ect…. according to their Requirments variants should be designed . We should not only depend on DRDO to develop weapons specially assault rifles , now a days the whole World is moving fastly towards 3 world war and in Country like India who is enternally suffering from terrorism , naxalites and anti social groups , and outside enemies like China & Pakistan , Indian Government should open the doors for foreign defence companied like Germany , USA , Russia , Japan , France, Australia, Sweden ,Italy , Isreal to work together in harmony under make in India concept without wasting Time plus our Government should make an Committee of Army superiors who can take fast decisions regarding deal of weapons . Our army needs best weapons and this can only be possible by this system . India should become a exporter of big & small weapons, rather than becoming an importer . Quite Nice article and knowledge about present situations. Why not go with a reliable and tested 30 caliber and a reliable reloading and bolt mechanism from M1 Garand which is functioning on the millions of rifles made worldwide for both civilian and military use. These are available in multiple calibers. Adapt it to the common caliber used by and in stock with the Indian armed forces. Why reinvent the wheel and waste money. God only knows these weapons actually are inducted and reach the soldiers who are trying to stop enemy and terrorists with 5.56mm INSAS for more than 15 years. The Indian Army wants to use what the British Army uses that is the SA80 it is an automatic rifle of A high quality which hold 21 rounds, I have used this weapon many years it is made for taking out the enemy . Or like all other things Chinese do need world to buy their product afterall but still want to act like a spoiled brat!! Need something like tavor or any other bullpup rifle..
India’s answer to demining solutions. A must have asset for Indian Defence Forces. Remotely Operated Vehicle Savior series made by Navyug Infosolutions (Group of ex-servicemen) to detect and dispose of bombs and IEDs with ease. Recently showcased at ‘Force 18 Training Exercise’ attended by army contingents from 18 ASEAN nations at the Aundh Military Station, Pune. Save your history lesson about evolution of rifles in India. It is pointless. Enough unpleasant words have already said about INSSAS.. It is the rifle which a highly stupid bunch of generals in eighties aped from the west. Nothing wrong with it except inferior to AK47. What is important is to chase the testing of Multi Caliber rifle. There is a good chance of corrupt generals sabotage the test and call for imports. Sir, Mr Danvir Singh – make it your mission to follow testing of this rifle and prevent its sabotage by the corrupt army generals with medals on their chest. Hari Sud you are a little brash in your views and not clear on the origin of the INSAS. It wasn’t a bunch of stupid generals but the ARDE which produced this weapon. It was rejected but political pressure ensured that it was dumped on the Army. Sir, what is your opinion on Excalibur and Ghatak assault rifle ? Thegun designed by OFB RFI cleared various test during it’s trial where most of the foreign weapons failed. What’s your opinion ? AAA MAN I HAVE FIRED MANY WEAPONS.. LOOK INSAS HAS A LIGHT RECOIL AND A GOOD ACCURACY..OBVIOUSLY AS U CAN EXPECT OF A 55 GRAIN BULLET OUT OF A 1:9/12 INCH TWIST BARREL. BUT I WONT TRUST IT IN ANY CASE IN BOTH OFFENSIVE AND DEFENSIVE PURPOSES. Very good write up.Highly informative article.Rightly said Indian army needs to develop its own philosphy. A most excellent and informative article. As an old timer and aside from mentor Mr. K. Subhramanyam the first in India to write taking the technical point of view as part of an article/analysis, I was continually discouraged at how few Indians wanted to get into technical details. Now a new generation of writers has come up, with military experience, technical grasp, and love of writing well. You are an exemplar of the new generation, made possible by the Internet and great reduction in Indian governmental paranoia regarding security matters. I am becoming yearly more optimistic that India is in good hands thanks to the rise of young people like yourself. If you have time, I’d appreciate if you could tell me the exact makeup of the section, platoon, and company. I am trying to get a sense of where we are in relation to the Chinese. I will be glad to send you whatever material I have on Chinese rifle company organization, though likely you are already familiar with the Chinese military websites. With the very best wishes for your future, and with thanks for educating both me and the Indian public! It is not due to lack of talent or know-how but due to lack of determination among the people who matters (politicians and politically appointed bureaucrats), that India is far behind in this field. If the above figures are correct, we can rope in the people in the know for a fraction of the price of the 3-4 billion deal and develop world-class weapons in this class. My faith in the Indian talent is based on the fact that our people are leading the big companies like the Microsoft, Google, Adobe, PepsiCo and others. Moreover, it is important that we rope in people (Indians) who know and love the job of making such type of weapons. If we put people who see their job as just another 9 to 5 job, then rest assured, our money would be going down the drain. The fundamental problem in India is the equating of “Indian scientists” with the engineers at the DPSUs when this is far from the truth. The best scientists and managers that India produces are no longer attracted to the sarkari world of the DPSUs and this is a reality that we much accept. The armed forces know this not just on an intellectual level but experientially due to the multi-decade record of the DPSUs and it is no wonder that given half a chance, they will seek to avoid another black hole leading nowhere. After all, it is their lives on the line, not the babus or politicians. Until the entire Indian industry, including the private companies, are pampered as much as the DPSUs and brought 100% on par, nothing will change other than the fancy program names and slogans. However, India may not even have the luxury of that process playing out in its own sweet time now and only a wholesale privatization of the DPSUs coupled with relevant changes in labour laws on a war footing will save us. The fact that India can’t even make its own bullets and rifles, let along jet fighters, should have been a kick enough to change things and that it hasn’t is an indication of how deep and serious the problem is. 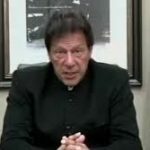 we often blame the civilian bureaucracy &the political leadership for the travails faced by the military but after reading this article, it seems that the military itself,in this case,the army is leaving no stone unturned in creating hurdles for itself.please think abt the jawans & the young officers who are roughing it out in the borders & other inhospitable climate to safeguard us.they deserve the very best the nation can provide & within reasonable time for them to carry out their responsibilities to the very best of their ablities. It’s a shame we are incapable of producing a metal for the rifle bbl even . Though we claim to be a nuclear power. We are still in 1945s technology. Less said the better. guess no hope for indigenous systems. Not entirely correct. The Services have been saddled with substandard equipment ‘indigenously’ manufactured many a time. The INSAS was no great shakes and not much liked by the troops . We have locally manufactured tank barrels blowing off. We have dangerous and undependable artillery and grenade fuzes causing numerous accidents. The ordnance factories making clothing and kit items palm off mediocre items to the soldiers . Many a time the quality ‘suffers’ after a few years and low grade items are then quietly substituted . Political and administrative pressures to save the DRDO and ordnance factories play a major role too. Yes , at times the Services also fault in giving stupid and ( un) imaginative GSQR’s. About two decades back some ‘wise nut’ in Army HQ decided to send Hero Honda type of under powered motorcycles to the Indian Army for trials to replace the 350 cc Bullet used widely in the Army . You can imagine two large soldiers in combat dress , helmets, with carbines/rifles, panniers attached -moving with an Artillery/ Armoured regiment on dirt tracks or in the desert on these ‘bikes’. What was there to confirm in the said trials?? Can you tell us how many times tank barrels blown off ? Initial stage of development there will be failure. Do you know F- 35 engine failed in the initial stage. I do not think these are big issues. First of all the attitude of army officers are not good. The Indian army didn’t even stand up its 1st Arjun armored regiment until May 2009, 35 years after the program began. To underscore the point, even that milestone followed a development that seemed to end the platform’s future. In July 2008, India had announced that production of the Arjun would be capped at the already-committed total of 124 vehicles. Instead, development would begin on a new next-generation tank, designed to survive and serve until 2040 or so. That appeared to close the book on a failed project, but opinion in India was sharply split. Many observers cited this as the final failure. Other were noting the problems with the T-90s, and the Army’s refusal to conduct side-by-side tests, alongside recent test successes that began earning the Arjun some military fans. In May 2010 desert trials alongside the T-90S, the Arjun did surprisingly well.” This was done during the tenure of GEN. VK SINGH. @Rahul Sing: Nearly every weapon has had teething issues. INSAS had those too. Smart people fix those issues and move forward. Retards dwell on those issues and waste time making snide remarks. Yeah many people design guns, but you seem to very conveniently forget that none of these individual guns are ever tested in battle. I would like to remind you that INSAS did very well in field trials also – but faced problems in extreme battle conditions. It is difficult to understand the mentality of people who do nothing themselves, but spend a lot of time getting in the way of people who are doing great things. Hi But wasn’t INSAS truely an embarrassing disaster? 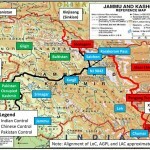 The Nepalese army fighting the Maoist terrorists armed with Chinese rip-off klashanikovs were stung when their very guns (INSAS provided by India) started playing the spoilsport mostly by heating up after firing multiple rounds forcing them to abandon positions and ultimately draw back. The Neps have not forgiven the Indians for the ‘DRDO lathi’, heavy, low quality and ugly as hell. iate effect – if not done already. More so rather definetly in case of Army and paramilitary forces. The huge cache of their INSAS already in use should be used to replace the obsolete WW2 relics, the Enfield 303s of police. In the light of the fact that Individuals, not organisations and companies in US (with amazingly lax/open gun laws) have been designing, developing and producing guns of all kind since ever which are nothing short of world standards bringing new design philosophy and other worthy innovation. Why DRDO can not do what smart individual gunsmiths are able to do so seamlessly is beyond comprehension except that it has the classic ‘chalta hai’ attitude towards it’s responsibility and unrealistic demands (as you pointed out earlier) especially on cost front. Most surprising part of procurement process is : there is no bound completion process of concludind the contract nd its implementation.This os because there is no corelation between procurement nd strategic preparedness. Who is responsible for delay? Pl give a thought nd have better preparedness to safeguard our country.Action must be time bound. I feel that India and its DRDO/ ARDE have come a long way and of age, and the Indian MCAR is the step in the right direction though INSAS had been plagued by its stoppages, jamming and other hickups, has been thought us something to learn from, which will help us make better ones, why even the American M16 was plagued with a lot of drawbacks while it was being used in the Vietnam War from which they learnt and built better ones, I wish MCAR team all Success and wish it joins service in our armed forces very soon and add a feather in to cap of ARDE, lets show the World that even India has the required brains to develop our own arms, Jai Hind! Army should assess qualitative requirements of weapon and equipment pragmatically based on tactical requirements in those theaters of war where it is likely to operate, capabilities of same class of weapon of adversaries and indigenous capability of design, development and manufacturing. And it should not be based on fantasy, whims and fancy of someone who is able to influence purchase decisions of weapon that suit a particular supplier. The corruption angle in defence acquisition starts with framing of GSQR. Importation of weapon should only be thought when there is wide gap in technology. Indian scientists have got the capability to deliver reasonably good weapon, provided user should clearly express its requirements honestly, and frequent changes are not made in GSQR. While going for up-gradation of weapon, views of designer and manufacturer of weapon should also be taken while framing GSQR as they can suggest some better alternatives also. So are they pitching MCIWS against these foreign carbines? And I know MCIWS has been in FT for quite a few times now. Any feedbacks!! Not that I expect something glorious from an Army which the Colt, CZ, Beretta brands failed to satisfy!!! 1.	this multi calibre controversy is a created one by competitors of Colt Company in US market it is like accept 5.56 or 6.5 or 6.8 if not accept all. 2. In actual fact what is required by any Army are a Carbine rifle or an assault rifle or a Battle Rifle to fire at short and long ranges with acceptable lethality. 3. This all boils down to a requirement of a rifle capable of firing at all required ranges in various operations which is barrier blind and has enhanced lethality or Range + Barrier blind + Lethality. a. Instead of changing the barrels change the BULLET (with different weight and ballistic coefficient etc. but of same calibre which can be fired from same barrel) one for long range (Sniper rifle/LMG herein barrel can be heavier) other for Assault Rifle and yet another for Carbine rifle so as to meet the requirement of Range + barrier blindness + lethality. b. This way all parameters can be met in most effective manner by slight change of Gas regulator position or choice of ammunition this will also ensure various types of ammo to us at all times in our kitty. 5. Col Danvir would do well to promote the cause of DRDO’s (ARDE) 6.6mm ammo claim which I think should effectively boil down to 6.35mm round. 6. It is not necessary to toe the NATO line of 5.56 mm the Russian’s have 5.45 mm and the Chinese 5.8 mm by adopting 6.35mm (actual 6.6mm) we might set the right trend in future small arms. 7. What is required is to support the ARDE and educate army personnel who are reading too many western articles and books. Well done you have exposed the secret. They are reading books and journals to prepare a specification which PSUs cannot manufacture and they can put pressure on the Govt. to purchase the same from foreign countries. This is going on since the death of Smt Indira Gandhi. The day we allowed the western and USA arms dealers in the Indian market. Scam started. India selected a proposal from Howaldtswerke-Deutsche Werft (HDW) over rival offers from France’s DCN, Sweden’s Kockums, the Netherland’s Nevesbu, and Vickers in the United Kingdom to deliver four Shishumar-class (Type 209/1500) diesel boats with an option for an additional two units. As part of the deal, the first two units were to be made in Germany and the second pair to be constructed locally from material kits. In 1984, India decided to execute its option for two further vessels, which were to be built locally. However, allegations of corruption and a lack of cooperation from HDW in the resulting investigation led India to cease its relationship with the German shipyard in 1988. Awesome rifle and also awesome post giving good information about guns of india. It is high time that we should stop hunting world over for assault rifles. Why are we still thinking on items already developed by other country? Why can’t we try to develop hand held laser weapon for army. Smt. Indira Gandhi paved way for the development of missiles. This fall the U.S. Navy ran successful testing of its first Laser Weapon System (LaWS). In 2016-2017 the navy intends to test the 100-150 kilowatt laser systems at sea, marking yet another breakthrough in the development of navy and regular weapons. Russia is also actively developing laser weapons, yet they are fully classified. None of the rifles will be suitable to destroy Humvees. Please read the report. ISIS has used these bomb-laden Humvees in waves of suicide bombings. Now Pakistan is trying to Purchase second hand Humvees used in Afghanistan from USA. The only effective weapon against Humvees is the deadly weapon like RPG-32 (DEADLY Russian RPG 32 anti tank missile). Its easy to actually build a laser as a weapon… People just are too afraid and want to deny the existence of it. I made a class 4445nm wavelength laser operating out of 1.5 wattes. A class 4 laser easily sets fires and causes perminant blindness if the beam even contacts your eye in a few fentoseconds. (If ya don’t believe me look it up, or if you’re an idiot… Try it on yourselves. Do not waste your time on analyzing outdated warequipments.. The INSAS was more or less rejected by the Indian Army, unfortunately it was forced down the Armys throat. I have been one of the trial officers in the chain. It was a cut paste job of mating different outdated technologies. The body of the weapon system was stamped fitting instead of moulded body. This was pointed out then by me. All the faults in the weapon which surfaced during the Kargil Operations were pointed out by our trial team, including the slipping of the selector which led to discharge of the weapon in full automatic. The weapon was rejected by my trial team inspite of a lot of pressure from AHQ. We in the Airborne Forces/Special Forces continued with the AK-47/M-58 series of weapons, while the rest of the Army had to lump it with the INSAS. It took DRDO more than 20 years to produce this shabby weapon. Hence the reluctance of the Army today to rely on DRDO. When we were purchasing weapons from abroad we should have gone in for joint production in India – this would have given us some platform for the future development of indigenous systems. We are unable to produce sighting system. Our Dheradun unit does not have the equipment to etch the bars in the sight to the required microns. We should go in for import or joint licenced manufacture of the sighting system in India. Well hope this time around the efforts of the DRDO bear fruit in the real sense. Top brass of Indian Army and Air Force seem to be keen to backstab DRDO and defame it at every available oppurtunity. They treat it like an outcast and unashamedly long to buy from the foreign manufactures. The foreign lobby-babu-militarytop brass nexus is all too apparent. Parrikar after bold initial statements seemed to be getting sucked in the red tapes which are bureaucrats and Army and Airforce top brass are so apt at spinning.I dare say we need to just do away with this top brass and top bureaucrats who have brought so much dependance on foreign manufacturers by their act of deliberate sabotage of Indian military modernisation. We need to lift the “fighting core” of the militiary to the decision matrix along with the DRDO scientists and the Raksha Mantri. And no bureaucrats please. Send them to the villages to ensure public upliftment which should be their primary goal.